It’s weird how I will sometimes remember something fun that happened a long time ago and then realize I don’t know any of the other people involved anymore. Makes it feel a little less real. Was it only a dream? I guess I’m the one to decide now. He should have high five’d the bug using a toothpick! 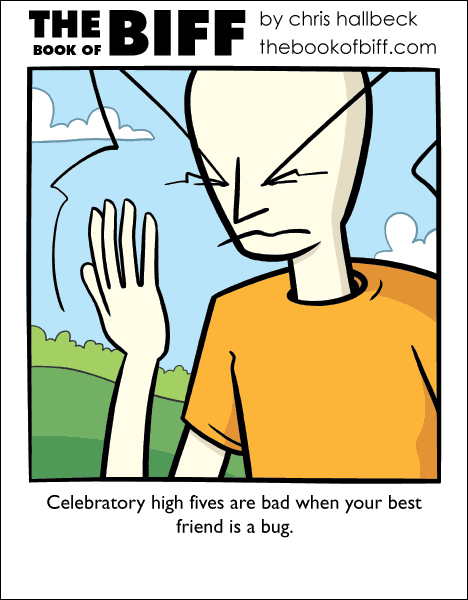 …But would that still count as a high five, or would it just be to poke a bug’s front leg using a toothpick? it’d be a high one, that would, on the more likely end, stabbing the bug, or at the least giving him or you a splinter. Like when I held my swimming lessons for grasshoppers and other insects. I’d put ’em in the water, leave ’em there till they started to sink, pull ’em out and let ’em recover, then repeat. I was like Grasshopper Guantanamo. Kids are cruel because they haven’t developed empathy yet. I’m not worried about the ones who will learn. I’m worried about the adults who refuse to.